New! Arino Maker is an Event Course in Super Mario Maker designed by Shinya Arino of the Japanese TV show GameCenter CX, and was released on November 4, 2015. It is one of three Event Courses to unlock the Arino KACHO Mystery Mushroom costume upon completion. The level starts with Bill Blasters shooting coins, along with some Goombas near various blocks arranged to spell "12十クGCCX". Thwomps appear afterwards, followed by more Goombas and a Super Star to take out the next set of Thwomps. 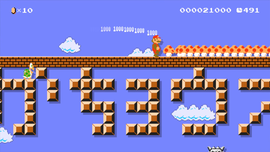 Some trampolines appear afterwards, leading Mario to an area above and a trail of coins leading to the Goal Pole. This course was made by Arino KACHO, from the popular Japanese video-game variety-show GAMECENTER CX. Here's a comment from the KACHO himself: "In this course, I tried to create a Mario experience like you've never seen before. Satisfying action is followed by my own brand of fiendish trickery. I hope you like it!" Shin! Arino Mēkā!! New! Arino Maker!! This page was last edited on August 26, 2017, at 10:10.